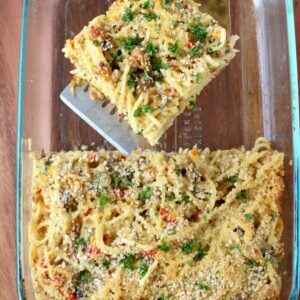 This Chicken Philly Cheesesteak Spaghetti Casserole is my new favorite pasta dinner! One bite and it might become your favorite too! It’s cold, freezing actually, and there’s snow and ice all over the place. But there are some good things about the cold weather…cold weather food. For some reason all the snow and ice gives us a reason to eat rich, tasty comfort food. 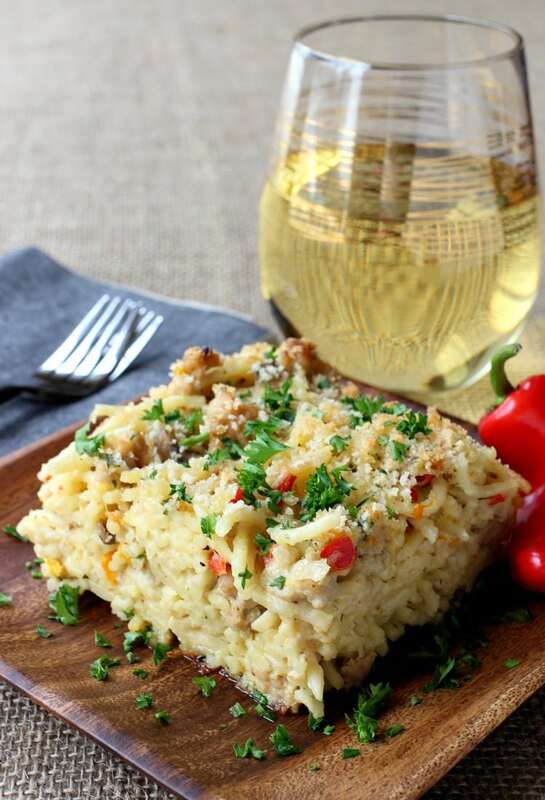 And this Chicken Philly Cheesesteak Spaghetti Casserole is the perfect dinner for that. 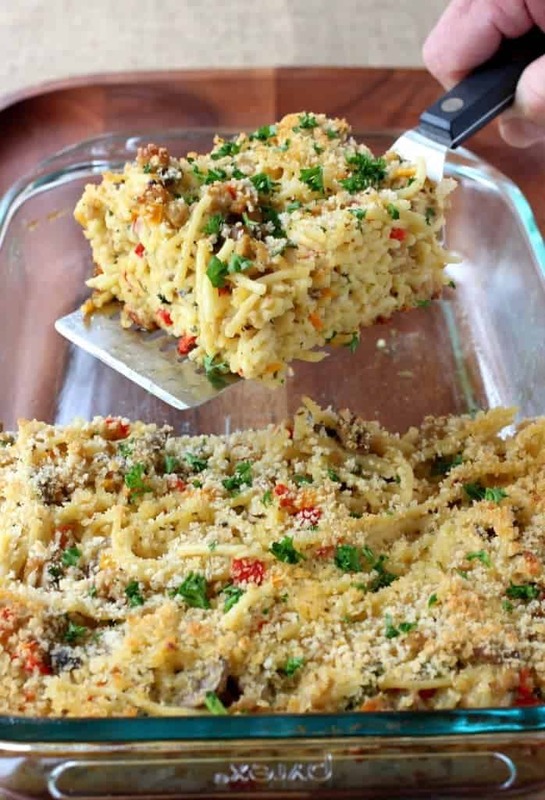 You can cut this casserole like a lasagna even though it’s spaghetti. It’s a great dinner for entertaining since it makes a lot, but also perfect for a family dinner…the leftovers are even better. 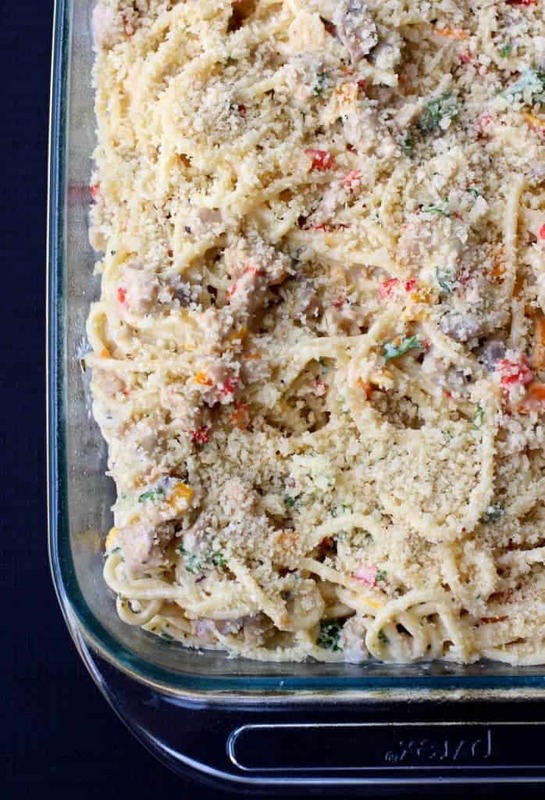 The spaghetti, chicken, peppers, onions and mushrooms all get mixed together with this quick homemade alfredo sauce, you have to take the extra couple of minutes and make this alfredo sauce. It’s SO easy but also WAY better than the stuff from the jar. 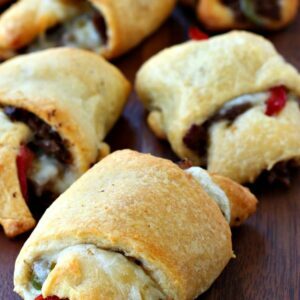 We used it in our Philly Cheesesteak Stuffed Shells and we’re totally addicted. 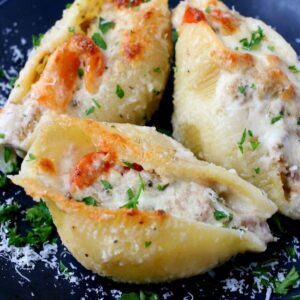 The filling comes together really easy – chicken, vegetables, cooked spaghetti and of course, the alfredo sauce. Mix it all together and pour it into a baking dish. Cover the top with panko breadcrumbs and get it in the oven. Let it cool as long as you can handle sitting there looking at it, then cut it into large squares and serve. 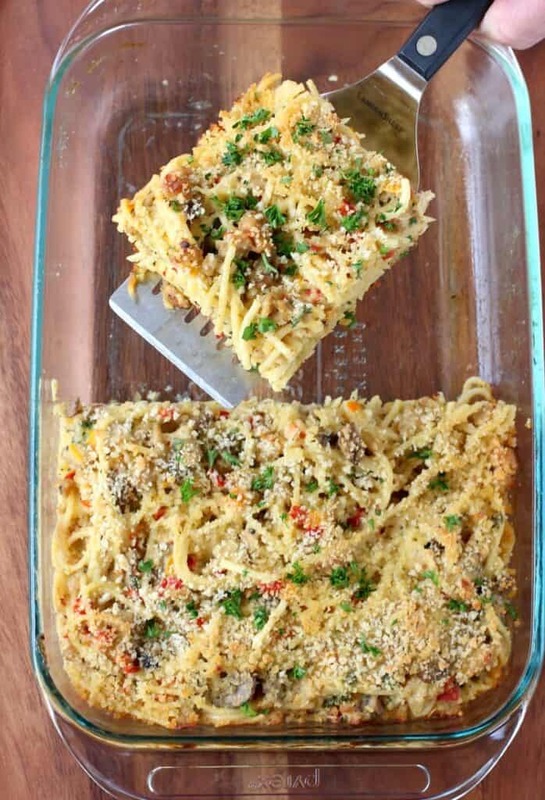 This Chicken Philly Cheesesteak Spaghetti Casserole is so crazy good you won’t be able to stop eating it – there will be clean plates all around – I guarantee it! Boil the spaghetti in a large pot of salted water according to the package directions. Drain the spaghetti, rinse with cold water and set aside. Add the olive oil to a large skillet over medium heat, then add the chicken. Brown the chicken while braking up with a spoon until cooked through, about 5-7 minutes. 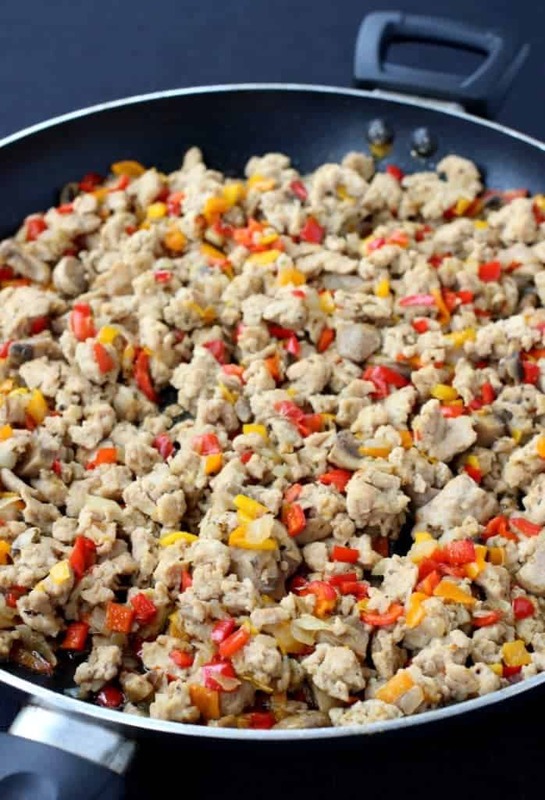 Remove the chicken to a bowl then to the same skillet add another tablespoon of olive oil, then the onions, peppers and mushrooms. Cook for 10 minutes until the onions and peppers are softened and the mushrooms are slightly browned. Add the chicken back to the skillet along with the salt, pepper, garlic powder, oregano and marsala wine. Stir to combine the seasonings and let the wine cook off for 2-3 minutes. Add the chicken and vegetable mixture to a large bowl and let cool. To a medium saucepan, add all the ingredients for the alfredo sauce except the parmesan cheese. Stir and let come to a simmer, reduce the heat to low and let simmer for 5 minutes. Add the parmesan cheese, stir and remove from the heat. Add the spaghetti and egg to the bowl with the chicken and vegetables and stir to combine. Pour the alfredo sauce over the top of the spaghetti mixture. The alfredo sauce will help break up the spaghetti if it’s stuck together or you can rinse it again in warm water right before this step. Stir to mix the filling together then pour into a 9″ x 13″ baking dish that’s been sprayed with cooking spray. Add the panko bread crumbs, cover with foil and bake for 25 minutes. Remove the foil and bake for 5 more minutes to let the top to brown. Garnish with parsley, cut into large squares and serve. Love your presentation! Great pictures! Whoa! This is some mega comfort food. I’m thinking my guys would go crazy for this! Thanks Rebecca! Our boys did! This looks amazing! I know the kids and hubby would devour this! Can’t wait to try it! 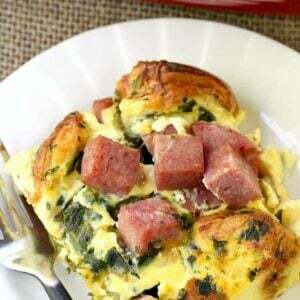 Such an awesome and creative recipe! You add the egg in with the spaghetti, chicken and vegetables. I updated the recipe card, thanks for letting me know!